Again Boyfriend and I may be late to the bandwagon but we finally visited Menya one day for lunch/brunch. But boy-oh-boy I never expected traffic to be so congested on a Tuesday noon hour on Broadway. Parking was hard to find! We made it anyways, and was glad that there were plenty of seats available. It also good that they take debit as payment. I could tell by the number of Caucasians that were eating here also. 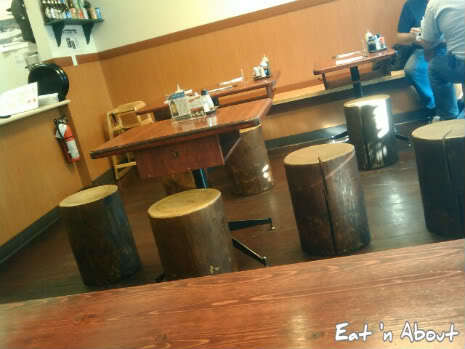 We also liked the tree stump stools, but we were glad we got the regular seats too. 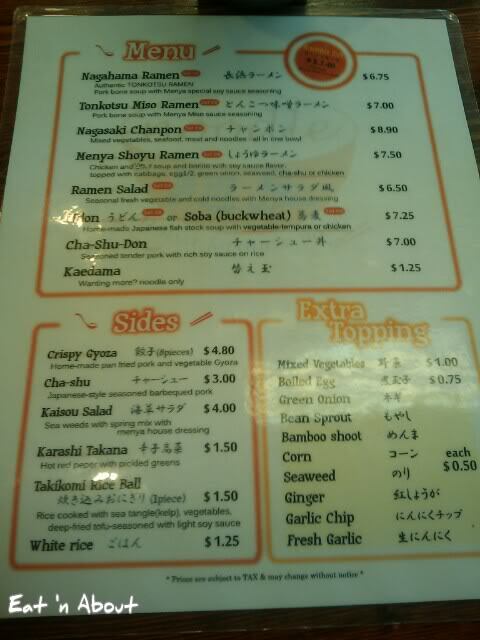 They have a simple menu, but it’s nice that they have more than 3 choices of ramen. 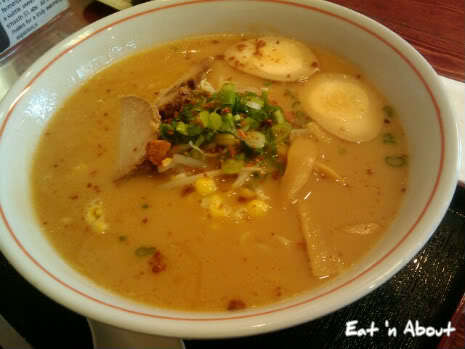 I chose the normal Nagahama Ramen with a boiled egg while Boyfriend chose the Tonkotsu Miso Ramen, also with an egg. This is Boyfriend’s ramen and it looked heavenly, with all the right toppings (corn, bamboo shoots, sprouts and cha shu!). 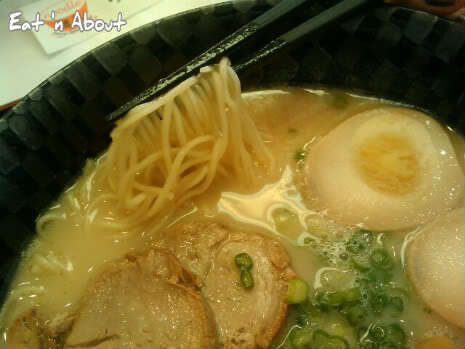 We also discussed how Menya actually gives you a WHOLE egg instead of just half an egg. He also really liked the idea of the slotted spoon haha, all the better for him to scoop up the residual corn and noodle bits after he’s finished most of it. The soup was really good. It tasted very much miso-like and wasn’t too salty. The noodles were perfectly chewy also. As for mine, I will have to say that this is probably the most flavorful tonkotsu soup I’ve ever tasted. It was just awesome. I can clearly taste pork bone in this and it was very intense. I didn’t care for the ginger though, I thought it took away from the overall taste of the dish. Enjoyed the seaweed black fungus and the egg very much though. The cha shu, however, I thought could’ve been a bit more fatty, but it being lean is definitely not a bad thing health-wise. Another thing to note, is that with the Nagahama (Hakata) Ramen, the noodles are actually different than the ramen I’ve been used to having. This one is round, kind of like a skinny spaghetti. I guess that’s the style of Nagahama. It was a bit unusual but still very tasty. Again the broth wasn’t as salty as most other places. 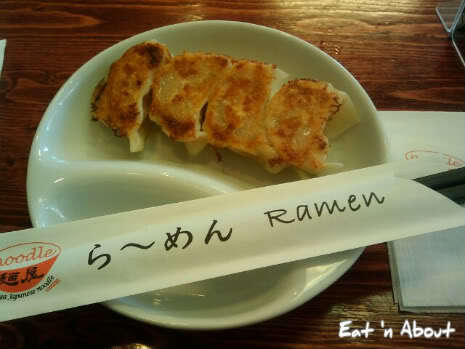 Also with my ramen, I made it into a ramen set so it came with an onigiri and 4 gyozas. This onigiri was much better than the one from Benkei. It was more flavorful and overall a much better chewing experience (did that even make sense???). As for the gyoza, they were quite on the small side. They were tiny. Boyfriend was not very happy about that. Nonetheless, the skin was very thin and smooth, and what little bites we had were very good. 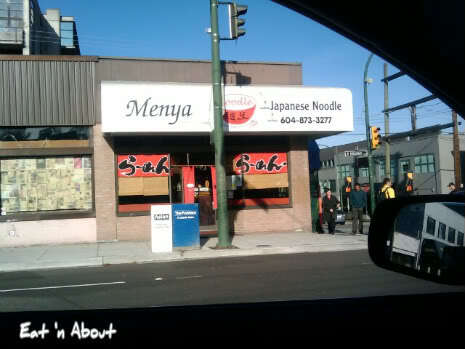 Hi Wendy: We had driven past Menya many a times and each time it was closed. Alright, we normally go downtown on Friday for our dinner at 4’ish when we pass by. Judging from your post, it looks like a must visit place. 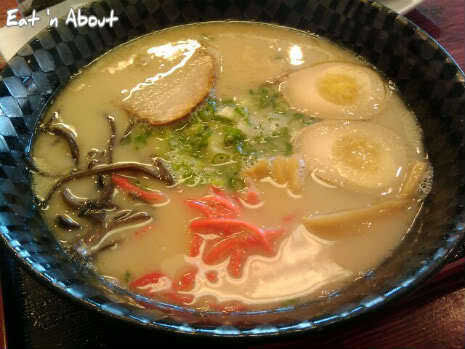 Suanne loves ramen and are especially great when days are getting colder! It’s nice to see someone say that it wasn’t too salty. I’ve been hearing so many people say it’s too salty that I was afraid to try it. Thanks. Ooh that’s a lot of pressure! Now I’m doubting my tastebuds! I trust you Wendy! 🙂 Don’t have to worry!!! What? No takoyaki! The shame! I agree with you that their soup base is not as salty as others, which is a good thing. 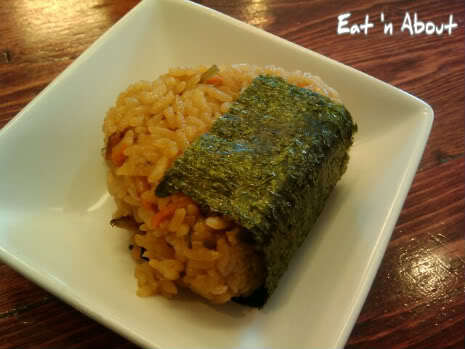 I also like their onigiri much more than Benkei’s, which fell apart and didn’t have much flavour. As for small gyoza, as long as it tastes good, I’m ok with that. Size is never an accurate determinant of good taste. 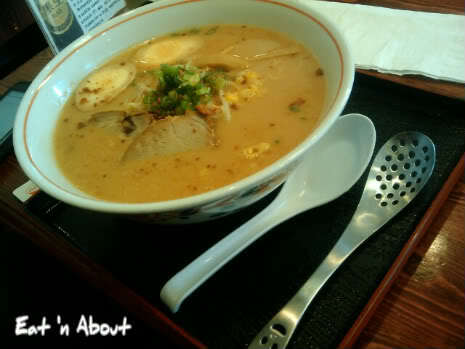 I would like to try the hakata ramen next time.